Tenerife has always been an excellent choice for Golfing Holidays - this is because of the range of championship courses that Tenerife Golfers can choose from and the second reason is the year round Sun that blesses the Island of Tenerife. 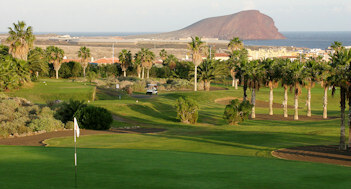 Amarilla Golf is located on the South of the Island, in San Miguel de Abona. It is an 18 hole course, with spectacular views over the Atlantic and the nearby Marina. All the usual amenities are included - Club House, Pitch and Putt, 9 Hole Course, as well as a Tennis Court and Swimming Pool! All professional services are available on site. Advanced booking is advised. Golf Las Americas opened in 1998 - and has gone from strength to strength since then. It contains a wealth of amenities on site - chipping and putting greens, driving range, pro shop, buggy bars, and normal restaurants and bars. One of the finest courses on the Canary Islands, this 18 hole par 72 course is regularly visited by pro's and amateur's alike. With something for everyone, there is also a 9 hole, par 33 course located within the site. A number of tournaments have been held at this prestigious golf course - from the BMW World Final in 1999 - right up to the Tenerife Ladies Open in 2005 and 2008. This course, designed by Dave Thomas, covers over Six Thousand metres of ground, and takes in over 22 lakes and 25,000 Palm Trees! As well as being a huge course, it presents serious challenges for both experienced golfers, as well as beginners. Nearly all of the spectacular holes have breathtaking views of the Atlantic Ocean and the Island of La Gomera.